Guatemala’s notoriously tumultuous volcano, Volcan de Fuego, exploded early Monday morning, spewing lava and billowing smoke into nearby villages. As of late Monday, the death toll stood at 65 and was expected to rise, according to the Associated Press. But Rebecca Williams, the head of geology at the University of Hull, said along with Fuego’s eruption came a spew of myths about volcanic eruptions and dangerous behavior. First and foremost: “There is no connection” between Fuego and Hawaii’s Kilauea volcanic explosion,” she told The Daily Beast via email. “Kilauea is a hotspot volcano, formed by an area of extra hot mantle, causing melting underneath, and in the middle of, the Pacific Plate.” Fuego, on the other hand, is a “subduction zone volcano,” which means it was formed along an active subduction zone along the western boundary of the Caribbean Plate. We also can’t predict volcanic eruptions like Fuego. “Volcanoes are complicated natural systems,” she said. “Eruptions can be triggered by a variety of different processes. The best we can do is to monitor a volcano and look for signs that there are changes in the magma reservoir”—and if so, monitor closely to evacuate at the first sign of an impending eruption. Williams added that at any point in time, there are about 20 volcanoes erupting. Last week alone, Williams said that 15 volcanoes erupted. The biggest, most viral—and dangerous—myth that Williams has seen involves the description of stuff that has come out of Fuego and flowed out into nearby villages with such deadly force. Some have described it as “lava flow,” but Williams took to Twitter early Monday to dispel that myth, saying the river of rock, ash, and gas that was tumbling through villages was not lava flow but rather was something called pyroclastic density currents. In fact, Williams said on her Twitter thread, it’s not lava flow that has killed thousands of people from volcanic eruptions, but rather pyroclastic density currents, sometimes referred to as pyroclastic flow. The reason why they’re dangerous is that they’re the volcanic version of an avalanche, composed of toxic chemicals, 1,000 degree Celsius gases, rocks, and ash. The term was first coined in the aftermath of the deadly 1902 eruption of Mount Pelee in Martinique, where pyroclastic density killed about 30,000 people in a matter of minutes. In total, they’ve killed 90,000 deaths since 1600 AD. Lava, on the other hand? Just a couple hundred deaths in that same time period, according to Williams. Williams stressed that speed of these pyroclastic currents was what made them especially dangerous: They can tumble at speeds up to 450 miles per hour. In any case, Williams said those flows were probably singlehandedly responsible for the deaths reported in Guatemala. And one thing to keep an eye out for? 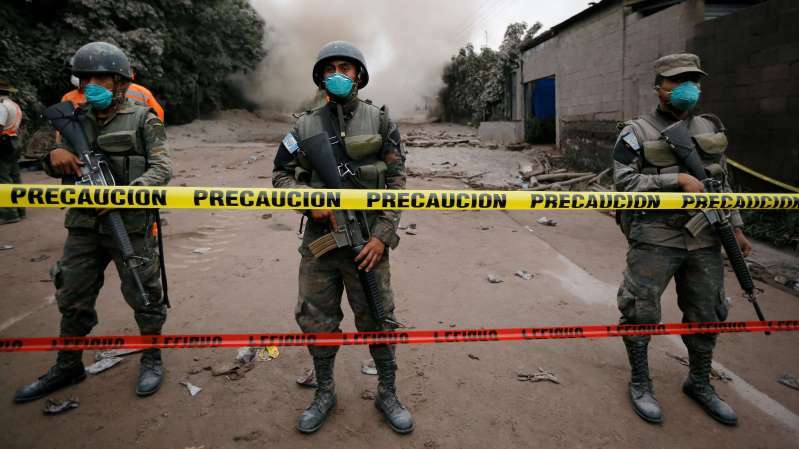 Lahars—loose deposits of ash and rock that mix with water (plentiful, since it’s Guatemala’s rainy season) to create deadly mudflows, which can continue long after the volcano has ceased to erupt, said Williams. For as much as science has advanced, we still don’t know much about volcanoes and how they actually work. “What happened to the volcanic system to trigger a significantly bigger event is still an unknown,” she said. What ultimately made Fuego burst, in other words, remains a mystery.